3D printing or, more exactly, additive manufacturing, is a manufacturing process whereby an object is created by adding layers of material. Traditional manufacturing methods are subtractive: you begin with a raw substance and remove material from it to obtain the desired shape. Additive manufacturing constructs an object based on a 3D model created using a computer. This model is sent to a “3D printer”, which deposits material layer by layer until the object has been formed. There are several different 3D-printing technologies using powder, resin or filament as the raw material. OWA supplies filament for this state-of-the-art technology which layers molten filament until the object has been constructed. OWA is committing to this new technology primarily because it resonates with our values. By definition, additive manufacturing considerably reduces the amount of material wasted when creating an object. There are no leftovers, as there would be in a subtractive process. It is a more responsible manufacturing process. Moreover, we believe in the circular economy and this industry offers countless unexploited opportunities for recycling plastic materials as a source of filament. Environmental responsibility is a part of this emerging sector’s DNA, but there are still plenty of initiatives to explore. This is the task OWA has set itself in manufacturing bio-degradable filament from recycled materials and providing a collection service. Both these roles will be carried via local distribution channels. By offering PS (polystyrene) filament, OWA is pioneering offering a material not previously used in 3D printing. OWA’s PS filament is made by giving new life to old materials, especially from used cartridges collected and recycled by ARMOR. The result: a 30% lower environmental impact in terms of CO2 emissions as compared with virgin filament. 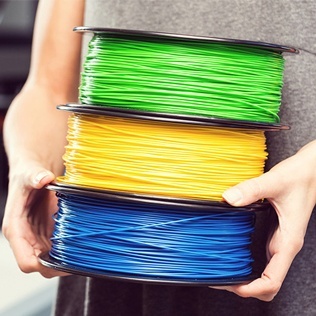 OWA also provides PLA filaments such as biodegradable PLA-S or PLA-HI with a four time resilient to shocks compared to PLA-S.
Other OWA certified products are also available such as TPU-92A and PETG-S.